Biography of the German-Brazilian journalist and typesetter who committed his life to anarcho-syndicalism and anti-clericalism. Brazilian typesetter, journalist and anarchist. 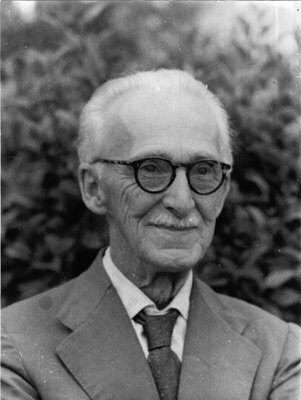 The son of a German doctor and a Brazilian mother, Edgard Leuenroth (1881-1968) spent 70 of his 87 years committed to the workers’ and anarchist movement. He was serving his apprenticeship as a typesetter, rubbing shoulders with the workers and publishing an unassuming little paper and had run up against the class struggle arising out of the widening social inequality in São Paulo when the Portuguese anarchist Neno Vasco arrived there in 1901. Edgard Leuenroth was involved in and infected by the libertarian movement and started to read the anarchist classics, making the acquaintance of Neno Vasco, associating with him and, with his help, rounding off his grasp of sociology and Portuguese. In 1903, in his capacity as a printing worker, he set up the São Paulo Typographical Centre and by the following year was helping to convert it into the Printworkers’ Union. From that point in he was a constant presence in the printers’ and journalists’ unions and played an active part in all the journalists’ congresses – in Rio de Janeiro in 1918, in Washington in 1926, in São Paulo in 1933, in São Paulo again in 1942 (to mention but a few). In labour and anarchist circles he never missed the state (São Paulo) and national congresses. He was to the fore in campaigns to secure the release of the great martyrs of bourgeois capitalism and the state: Ferrer, the ‘Idalina Affair’, Durruti, Nicolau, Mateu, Nestor Makhno, Sacco and Vanzetti, to name only a few, and he resisted the deportation from Brazil of foreign-born anarchists. He was involved in numerous strikes, notably the 1917 strike when he was arrested and tried before the São Paulo Courts as the mastermind behind a strike that resulted in one of the biggest working class uprisings hitherto recorded in São Paulo and in Brazil, with businesses coming under attack, barricades erected in the streets and fighting with the state government’s armed forces and the deaths of two strikers. At that trial he was defended by lawyers Evaristo de Morais (senior) and Marrey Júnior and the defence argument was released as a pamphlet in Rio de Janeiro in 1918. Edgard Leuenroth was one of the most prolific activists on the labour and anarchist press scene and signed articles using the noms de plume Frederico Brito, Routh, Palmeiro Leal, Len, Leão Vermelho and Siffleur as well as under his own name and was also an outstandingly fluent public speaker and street agitator. There was nowhere he would not go, nor did he ever miss a chance to spread his ideas. He helped launch, edit and contribute to the following newspapers and reviews: O Boi (1897-1899), Folha do Bras, O Alfa (1901) in Rio Claro and O Trabalhador Gráfico (1904). From 1905 to 1911 he started out contributing to the anarchist weekly A Terra Livre, launched and run by Neno Vasco: in 1906 he was on the staff of the anarcho-syndicalist Luta Operária, the organ of the São Paulo Workers’ Federation. That paper played a big part in the 1906 São Paulo RailRoad Company strike which made a national impact. He founded A Folha do Povo as a periodical and later daily paper and was its editor-in-chief. From 1909 to 1935 he directed A Lanterna, the anti-clerical libertarian paper launched by Dr Benjamin Mota in 1901: he did so in two stints that won him lots of friends and earned him some terrible enemies. He was arrested at the time that the Church was exposed in connection with the Idalina Affair. In 1912 he launched A Guerra Social, the São Paulo newspaper, acting as its main editor and at the end of 1915 he was actively contributing to the daily O Combate.